Ok, I’m on a roll here, two posts within the one week. 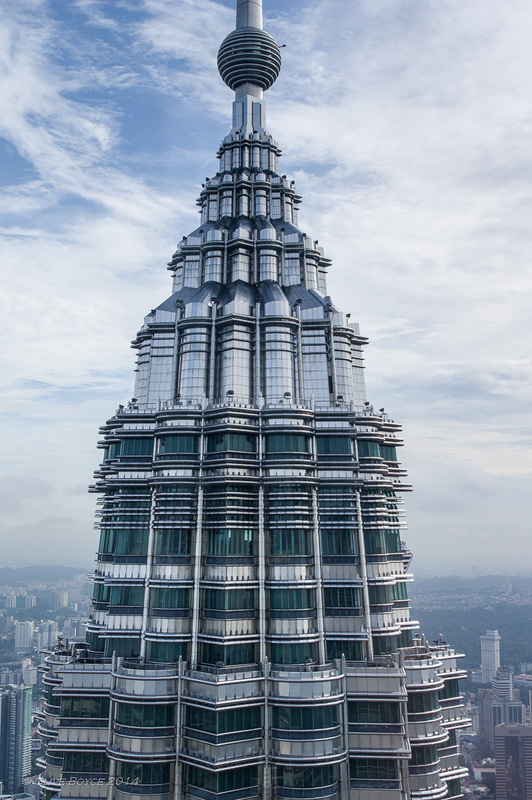 A trip to Kuala Lumpur’s Petronas Twin Towers is today’s subject. 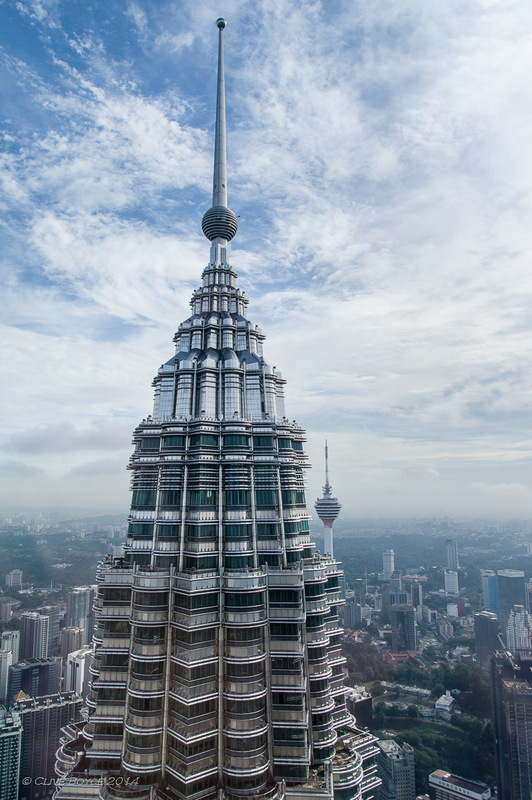 One of the world’s most recognisable buildings, the Twin Towers are in central Kuala Lumpur and a tourist ‘must see’ attraction. At 452 metres tall (a smidge under 1500 feet), the Twin Towers held the record for the world’s tallest building from their completion in 1998 through to 2004. The Twin Towers featured extensively in the 1999 heist film Entrapment starting Catherine Zeta-Jones and Sean Connery which had some great stunt scenes involving the Skybridge joining the two towers. Tours of the Towers are available, but numbers are strictly limited so it pays to book in advance on the Internet for a specific tour time. If you just turn up at the Towers, you may find the day’s tours are booked out. 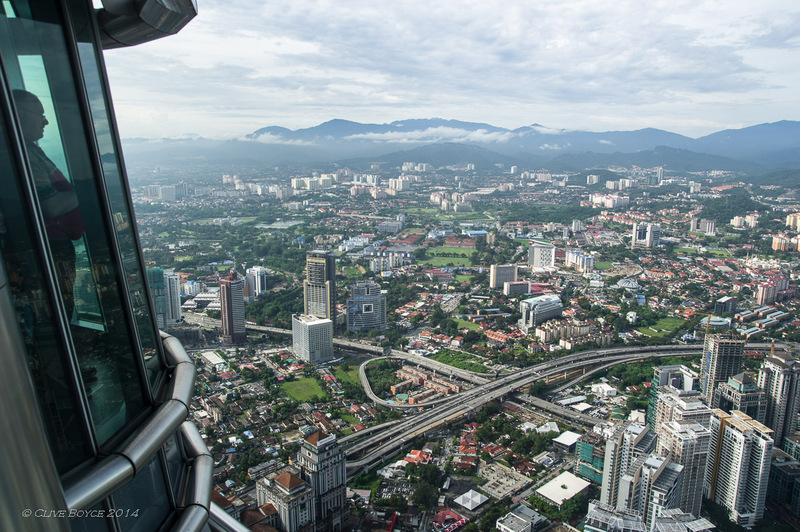 If travelling to the Towers by the KL monorail, Bukit Nanas or Raja Chulan are the two nearest stations. I got off at Raja Chulan and about one street away from the station found the entrance to a mixture of covered walkways and basement tunnels that take you all the way to the Twin Towers. Bit of a maze but the signage is more or less reasonable. Drop breadcrumbs regularly on the way in and you should have some hope of finding your way back to where you started. The walkways and basements are air-conditioned which was a blessing with KL’s heat and humidity. Ok, hands up, who can remember the 1960’s TV series “Time Tunnel”? 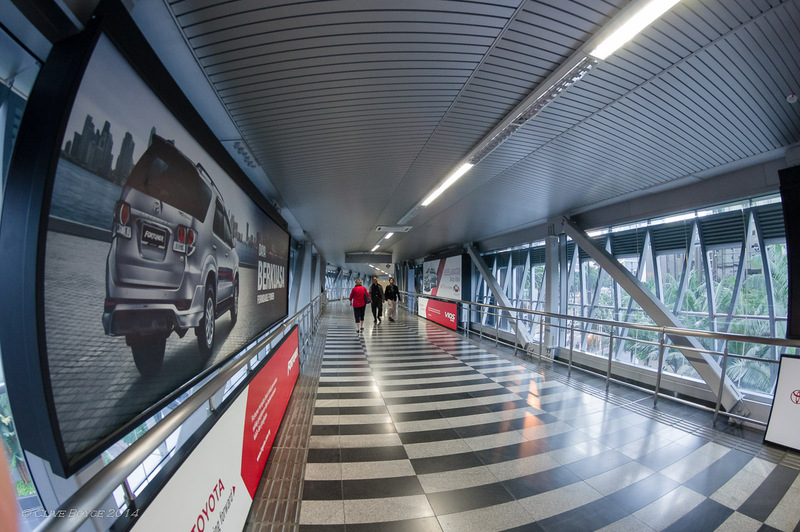 One of the enclosed walkways between Raja Chulan monorail station and the Twin Towers. 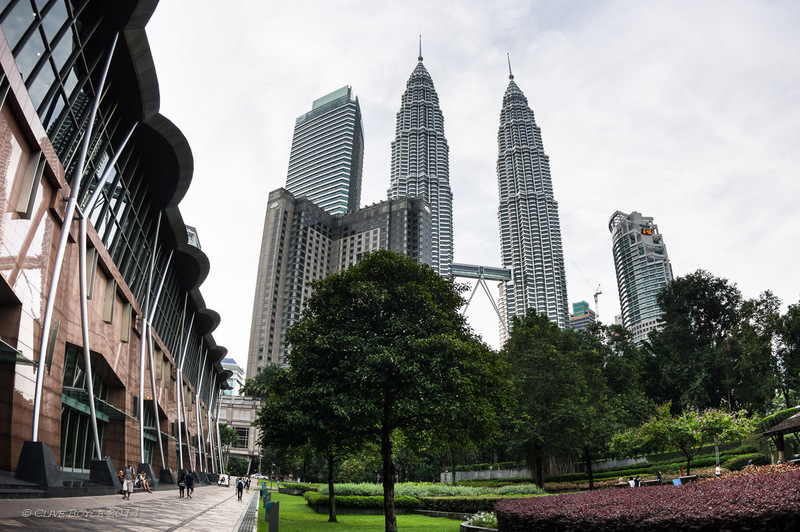 Depending on where you exit the walkway and basement maze, you may end up in this corner of Kuala Lumpur City Centre Park (aka KLCC) and get your first close up view of the Towers. Alternately, continuing along the basement walkways will eventually take you straight into the lower ground floors of the towers. View of the Twin Towers main foyer entrance which is on the northern and opposite side from the KLCC Park. 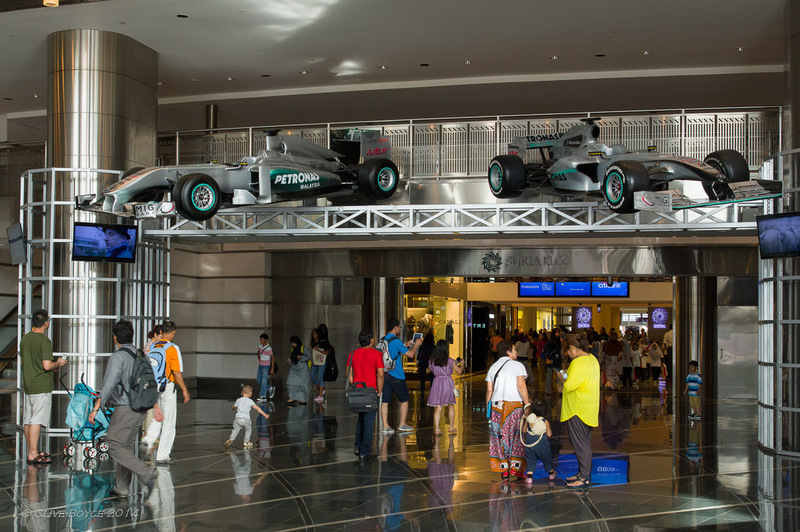 Malaysia hosts a round of the Formula 1 racing series and Petronas, Malaysia’s state owned oil company, sponsors the Mercedes AMG team. 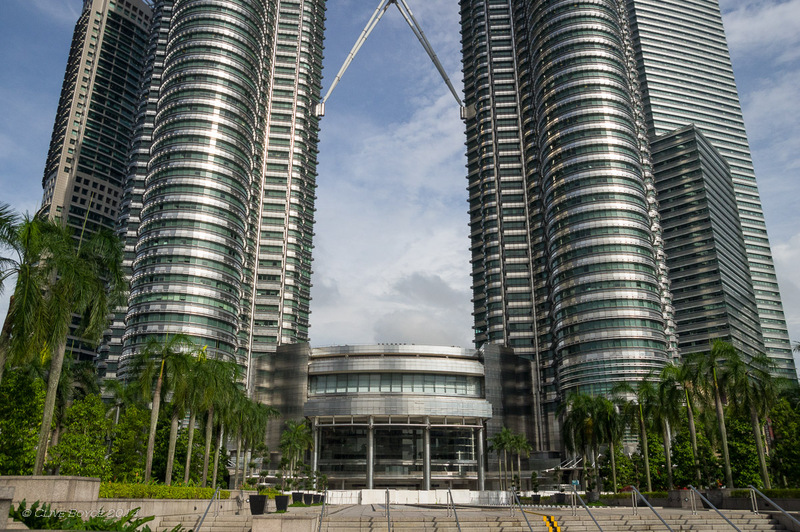 Petronas is headquartered in the towers and holds the naming rights on the Towers. Here we have a little product placement in the foyer. 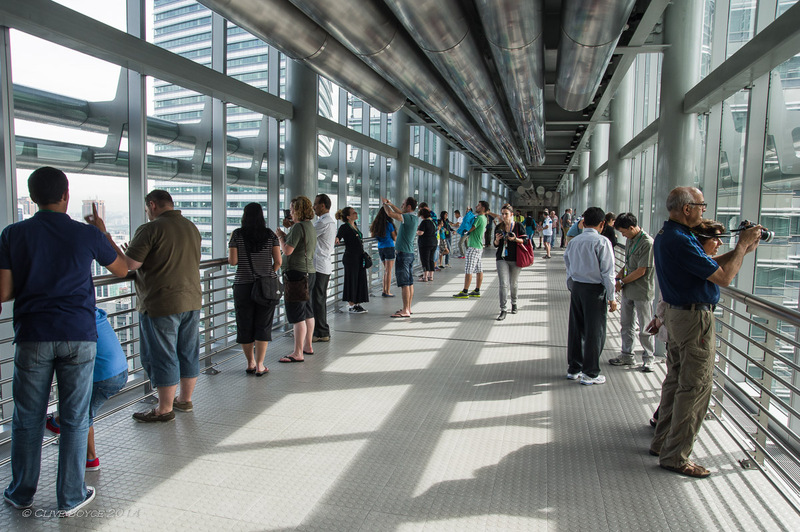 First stop of the tour is the Skybridge linking the two towers at Level 41 and 42. The benefits of visitor numbers being restricted is apparent here – lots of room to move about to take in the views. The Skybridge sits on rollers at each to allow the towers to move independently of each other when swaying in strong winds. 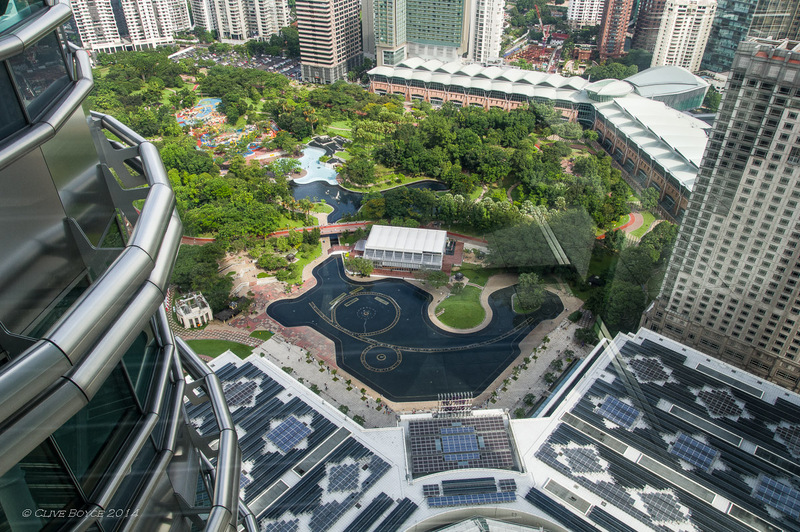 Looking down on the KLCC Park from the Skybridge. The park and the immediately surrounding buildings including the Twin Towers was once KL’s horse racing track until redeveloped in the 1990’s. We are 170 metres (558 feet) up at this stage. 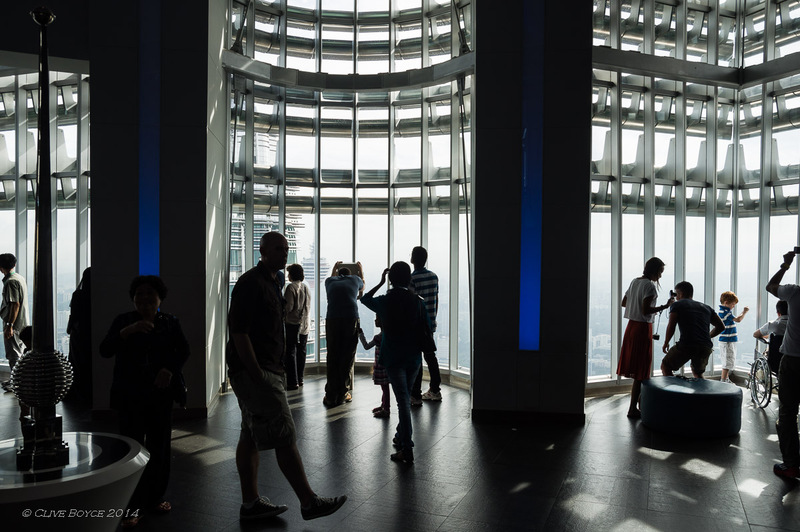 On the observation floor at Level 86, 360 metres (1170 feet) above the ground below. The view out to the north east of KL. Earlier in the day we had been to the Batu Caves and the rain that started there had just cleared in time for our Twin Towers visit. As a result the view was initially remarkably clear and free of haze and smog. The Intermark development comprising two office towers, a hotel and a shopping centre. My day job is with a superannuation fund (pension plan) and the portfolio I manage has a financial interest in the Intermark development, hence my interest here. 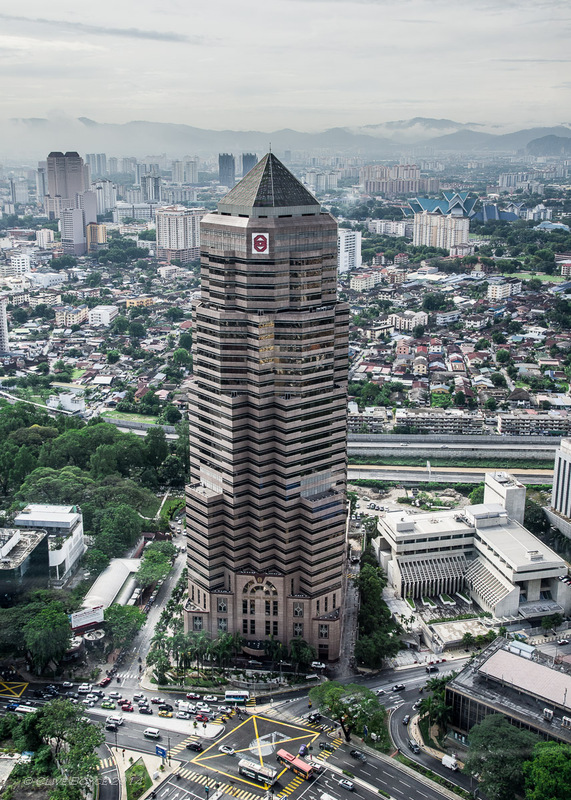 Headquarters of the Menara Public Bank. Looks a bit like the Lego space rockets I used to build (a long time ago). 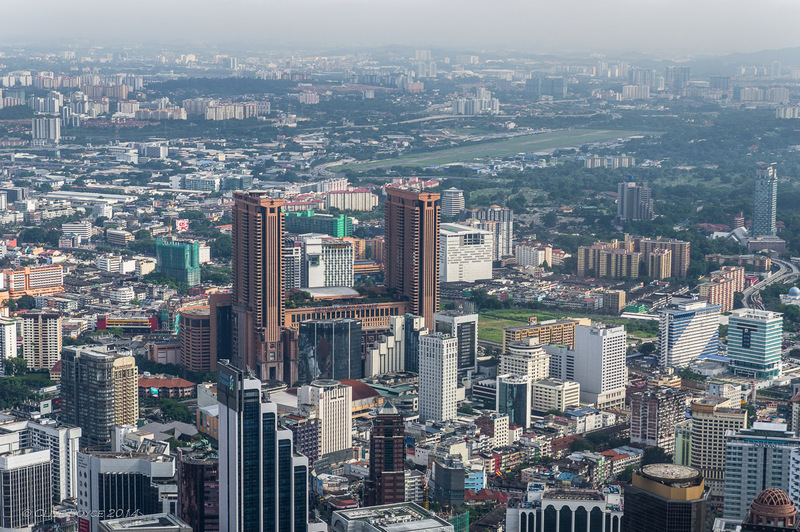 Greater Kuala Lumpur is home to some 7 million people, and looking south Kuala Lumpur sprawls for miles down the Klang Valley. Kuala Lumpur translates from Malay as ‘muddy confluence’ referencing its location at the junction of two muddy rivers. The twin brown towers connected together is Berjaya Times Square. The right hand tower is a hotel and our room was about 3/4 of the way up in a corner room on the right. Remember this for the next post coming to Photo Morsels. 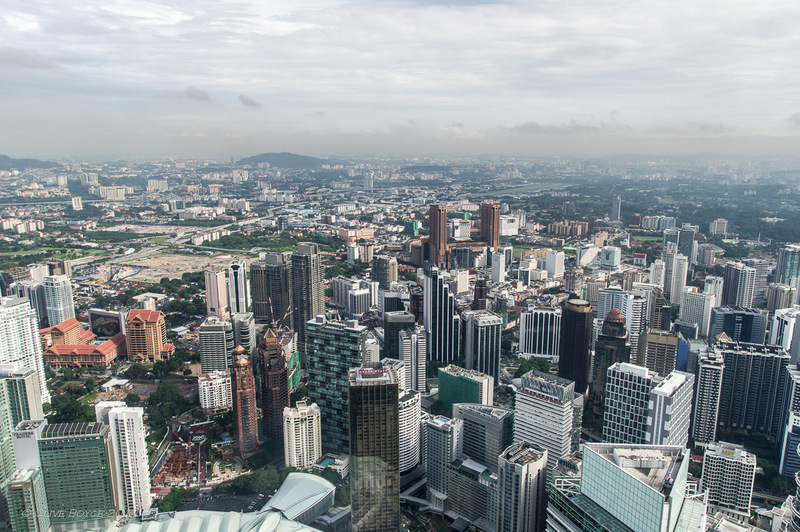 The city centre area of Kuala Lumpur is still modernising. 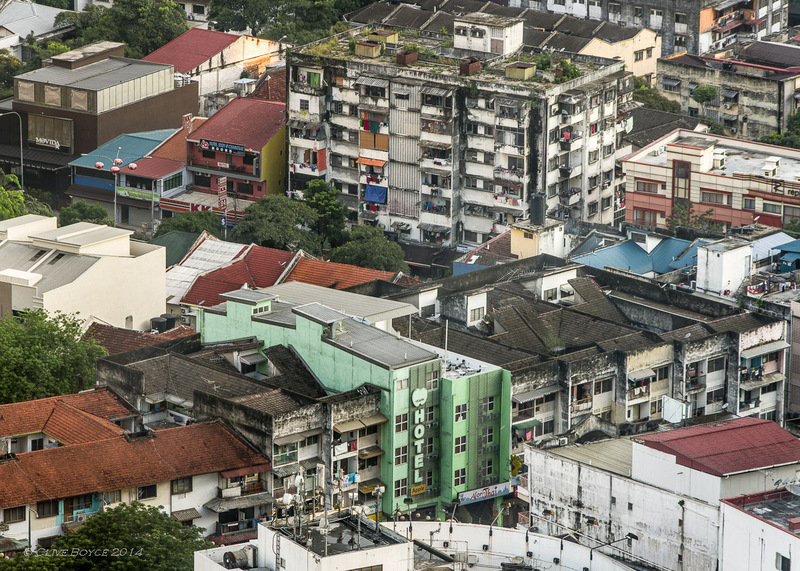 In among the modern concrete towers and shopping centres, pockets of the old Kuala Lumpur remain. You really need to be up close like this to appreciate the towers’ fabulous detailing. The design looks to integrate Malaysia’s Muslim religious identity with its long and rich tradition of pewterware manufacturing. Hence the minaret inspired spires and cladding in stainless steel panels. The tower in the background is the KL Tower, located about 1 kilometre away from the twin towers. Back on the ground now and a quick look at the Suria KLCC shopping complex which is integrated into the base of the Twin Towers. 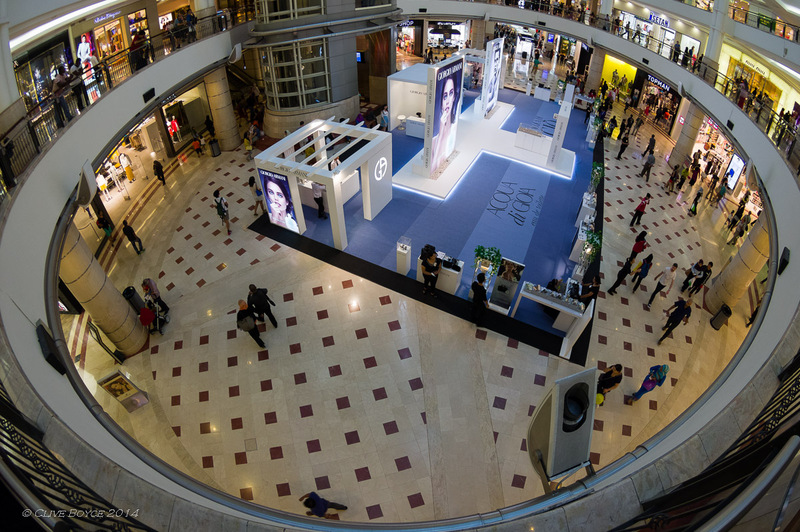 Suria KLCC clearly looked to be KL’s best shopping centre and all the big international brands were there. 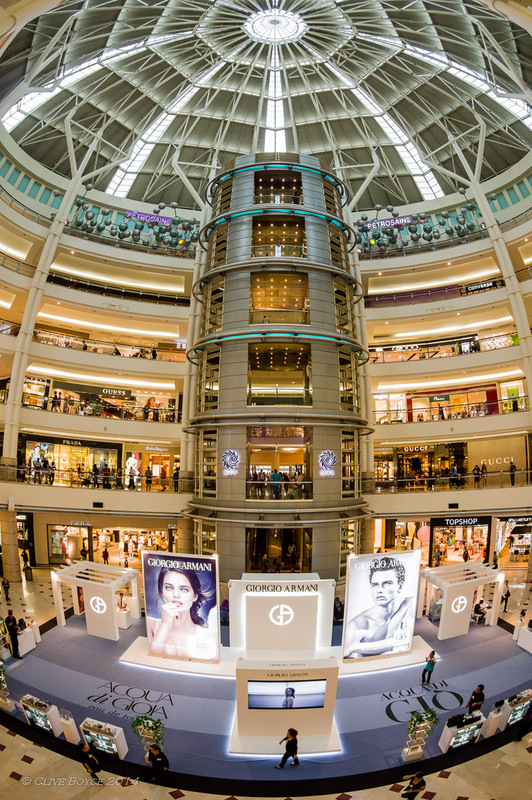 If you want to indulge in some serious retail therapy within Malaysia, this is the place to go. 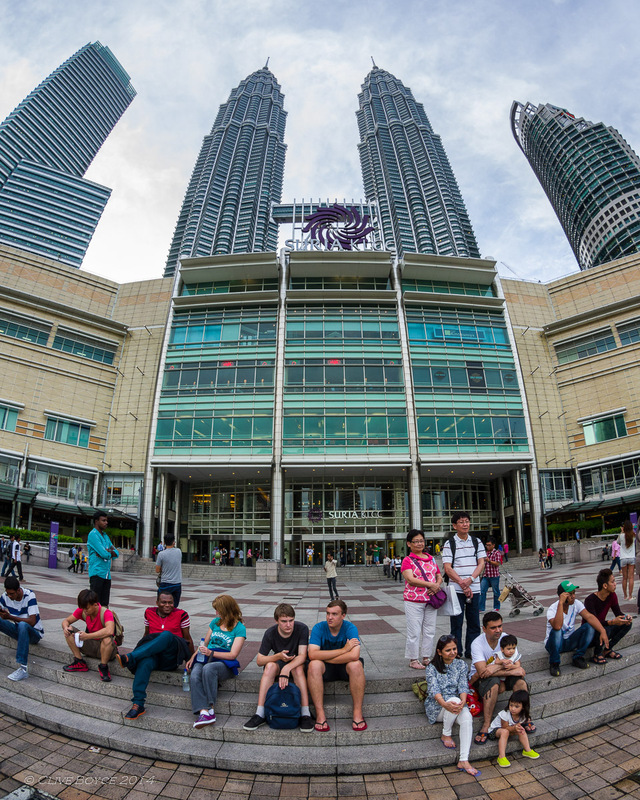 In addition to lots and lots of shops, other attractions include a cinema complex and a Petronas sponsored art gallery. Towards the end of the day, the steps out front of Suria KLCC are a pleasant place to stop, chill out for a bit, and watch the ever-changing fountain display in the lake. Pentax K-3, mostly with the Tamron 17-50mm F2.8, but the Pentax 10-17mm fisheye zoom was popped on for the shopping centre interiors and some of the outdoor images. 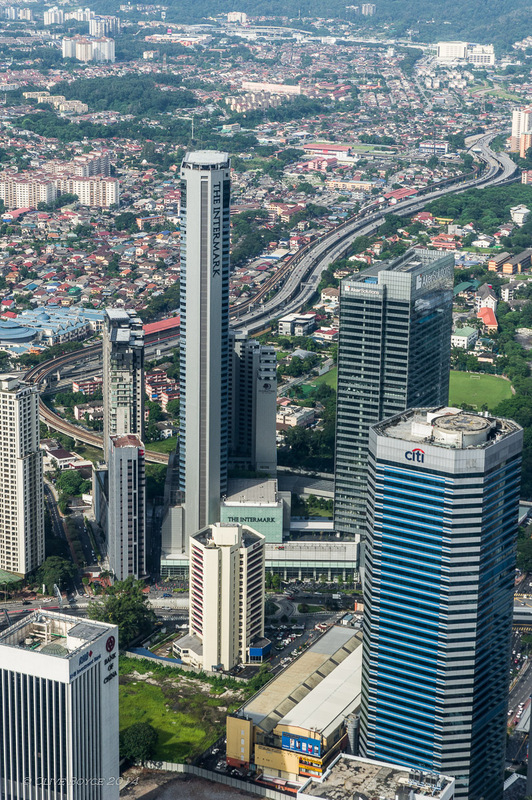 The Twin Towers are in the area of central Kuala Lumpur known as the Golden Triangle. 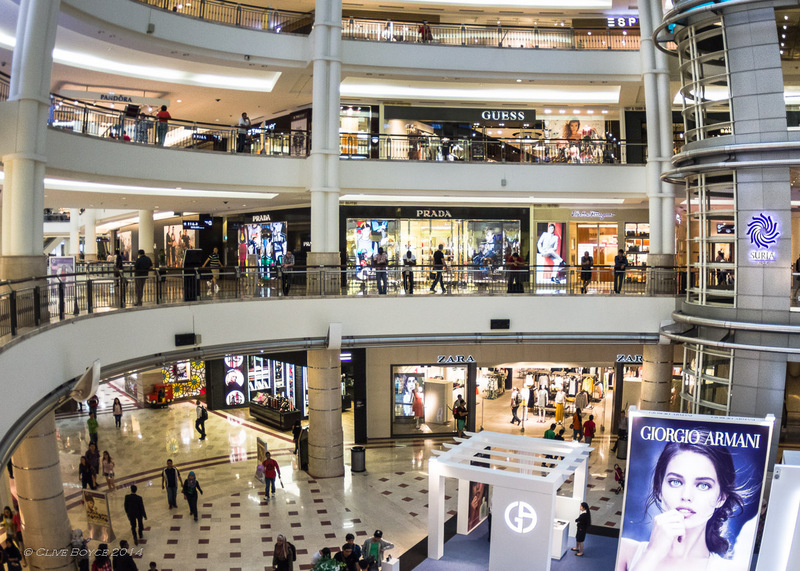 Most of the upmarket shopping centres and nightlife are in this general area. 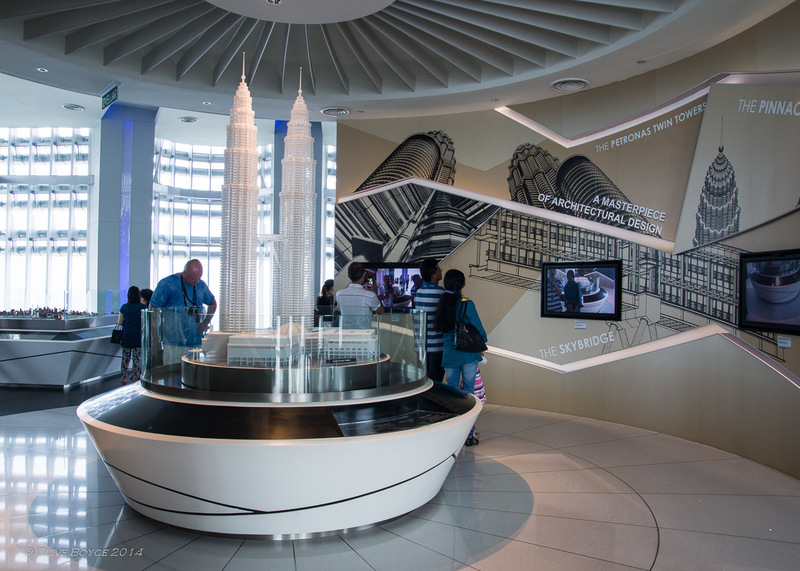 Twin Towers tour information can be found at the Petronas Twin Towers website. This site is also were online bookings are made. You book for a specific time and them simply turn up 15-20 minutes before your tour. Ticket cost (as at January 2015) is 80 Malaysian Ringgits for adults and 30 Malaysian Ringgits for children. For a family of two adults and two children this works out to be around 75 Australian dollars, so not exactly a bargain. However the tours are very well managed and with limited numbers in any tour group you have plenty of room to move around the observation areas and never feel like you are jostling with others for a view. Very different to the Empire State Building in New York where a ‘cram the punters in and let them queue for hours’ approach is adopted. And the Twin Towers and the view from them are impressive. Overall, it’s worth the money. 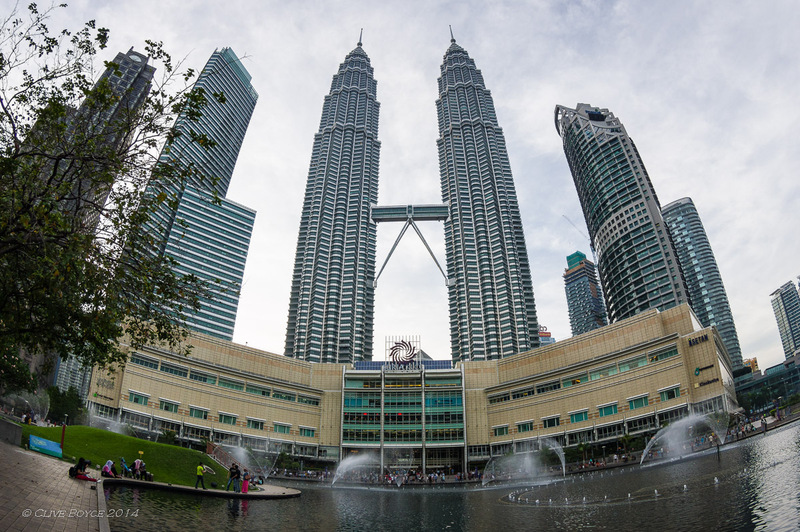 This entry was posted in Malaysia, Overseas Travel Locations, Places to Visit and tagged KLCC, Kuala Lumpur, Malaysia, Photography, places to visit, Suria KLCC, Tall Buildings, Twin Towers on January 14, 2015 by aussiesouthlander.